Chrome uses on Windows could not use Chrome Stable and one of the pre-release versions of the browser side-by-side up until now. This changes with today's announcement as Google lifted the restriction. This means that it is now possible to install and run Chrome Stable and pre-release versions of Chrome on Windows. Google notes that this has been a problem for web developers as they had to decide between running stable Chrome for testing or a pre-release version. Historically it's been impossible to install these pre-releases on the same computer as stable Chrome, forcing developers to choose between testing their site in the next version of Chrome and experiencing their site as users see it now. Chrome users may install and use Chrome Beta and Chrome Dev on the same computer that Chrome Stable is installed on starting today. This adds Windows to the operating systems that support side-by-side installations (Android and Linux support the feature already). Google promises that it will bring the feature to other platforms in the future as well. Chrome Stable users and admins can install Chrome Beta or Dev from the official download site. 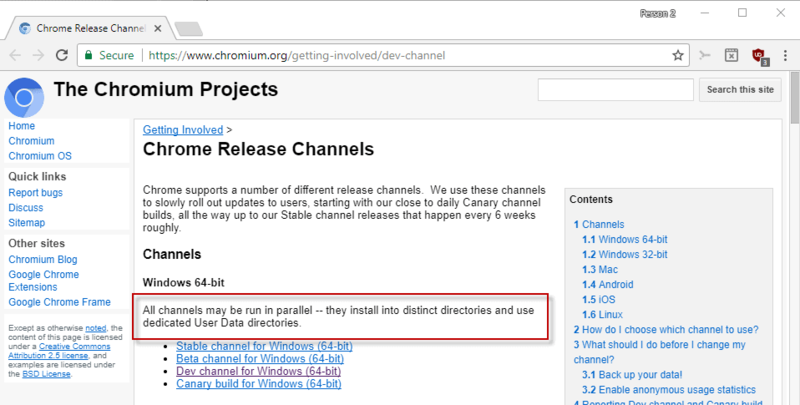 The page highlights the fact that all Chrome channels may be run in parallel on Windows. Pre-release versions of Chrome need to be removed and re-installed if Chrome Dev or Beta are installed already on a system with Chrome Stable according to Google. Google suggests that users sign in to Chrome to enable sync before removing the development versions to get bookmarks, settings and other data synced after the re-installation of the development version on the system. Canary and Chromium versions were exempt from the restriction in the past. I checked the Chrome installations on a test PC and found Chrome Stable, Development and Canary installed on it. While I cannot say anymore whether it was possible to run the browser's side by side, installation at least seems to have been possible before. I'm able to run Chrome Stable and Dev side by side however without going through the recommended removal and reinstallation of Chrome. I'm not sure if this has something to do with me using an offline installer for Chrome, or using different profiles for Chrome Dev and Stable. Now You: Do you run Chrome? There is no point using Nightly, dev or canary or windows test builds if you’re not willingly to submit feedback. We all know what so called Windows ‘testers’ never submit issue to MS and then afterwards people complaining about KB problems on each Windows patchday. Guys cut it off, seriously. If you use such builds, provide feedback and if not, just wait – if there are urgent security updates then they anyway push it to the stable channel for all. Windows Insider Preview is (was?) free, so I guess that’s a pretty good reason to use it. I still have it, and I don’t remember purchasing a license for it. Regarding browser nightly builds, if you’re a web developer, you get to try out the latest features as they’re announced in posts and on Twitter. You also get the latest developer tools improvements. Nightly builds also have better performance (esp. Firefox Nightly right now). That’s most incredible stupid answer I heard for a very long time. If you want free things, then use Linux instead. Besides this the Pro upgrade trick in Windows still works, even after one year now. You choose performance over stability and recommend this? That’s a big fat no, developers also not need latest tools, especially if there half cooked or not even close to be final. Maybe look around, there at the end less benefits except that you can’t use it .. oh wait the entire web extension story .. I forgot, sure but go one use the latest developer tools and see what you can do when nothing works. Total nonsense! Every single time I start up Chrome Dev or Nightly I will proudly give Google and Mozilla a one-finger salute. All the sheep can contribute their data in my stead. You have Never heard me complain about bugs in Dev or Nightly. For that matter, every single browser has it’s own issues. KB bugs are about the same old incompetence from Redmond that they have been distributing for many, many years. Which is why the Win10 home users are now the designated guinea pigs. And there is a legitimate reason why I haven’t used Windows auto update since back in my Win XP Pro days (I do have the July security updates) and if it needs explaining there is no point in wasting my time. There are many reasons why someone would want to use the dev builds of browsers. Chrome for example: when is material design going to be forced down stable users throats, how is video playback working with my graphics driver, what flags are being taken away, flags added (like AsyncImageDecoding), command-line switches still working? Is the way that I partially disable Google Update going to continue to work? Same thing with Nightly!!! How is e10s working, Servo, WebExt APIs. What changes are going to be needed to get css to work for certain elements. Have I slipped into a parallel universe? I’ve been running Chrome stable and Chrome Canary side-by-side for years now on Windows. You could run Chrome and Canary side-by-side, sure. But if you tried Stable & Beta, Stable & Dev or Beta & Dev, together. It wouldn’t work. This was eerily similar to how only Firefox Developer allows for a separate profile for side-by-side (by default,without -P no-remote hackery). What about dev and Beta with the new method ?